Founded by Alexander the Great and built by self-styled Greek pharaohs, the city of Alexandria at its height dwarfed both Athens and Rome. It was the marvel of its age, legendary for its vast palaces, safe harbors, and magnificent lighthouse. But it was most famous for the astonishing intellectual efflorescence it fostered and the library it produced. If the European Renaissance was the 'rebirth' of Western culture, then Alexandria, Egypt, was its birthplace. It was here mankind first discovered that the earth was not flat, originated atomic theory, invented geometry, systematized grammar, translated the Old Testament into Greek, built the steam engine, and passed their discoveries on to future generations via the written word. Julius Caesar, Mark Antony, Cleopatra, Jewish scholars, Greek philosophers, and devout early Christians all play a part in the rise and fall of the city that stood 'at the conjunction of the whole world.' Compulsively readable and sparkling with fresh insights into science, philosophy, culture, and invention, this is an irresistible, eye-opening delight. At times enthralling, sometimes difficult to keep track of while driving, this was nevertheless an interesting account of Alexandria from 300 BC to 500 AD or so. I had to look the region up on a map to make sure I understood what was being talked about while driving later. Some parts were very complicated to keep focussed on while driving, particularly the religeous intrigues in the last few disks. Worthwhile, particularly if you like history. For anyone interested in ancient history or cultures, this gives a well written overview of the fortunes of one of the great cities and civilizations of humankind. I think I learned more from this book about concurrent regional events and history than I ever did in a World Civ class. Well written, fact filled, colorful, incisive, just plain fun and of course, beautifully read by Simon Vance. I'd recommend this book to anyone the slightest bit scholarly with an interest in Greece, Egypt and the Jews. Very interesting book. A lot of information in it. Old subjects of discussion and debate that are still very much alive today were also addressed more than 2000 years ago. That puts today's way of thinking into perspective. We also learn a lot about famous philosophers and other social figures. 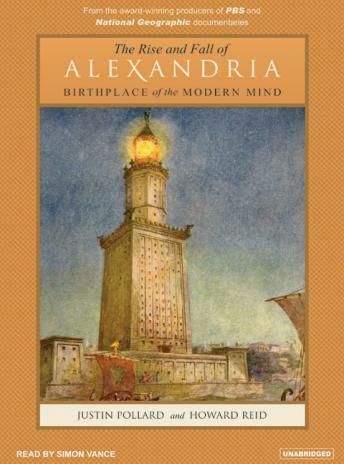 If you like history, you'll enjoy this book on the history of Alexandria, Egypt. I learned so much, and what was particularly amazing is that Greece played such a big part in its' history. I'll never look at an ancient picture of an Egyptian quite the same way......wondering is this a native Egyptian, or a person from Greece? Founding of the city, odessey of Alexander's remains, the Ptolemy pharaohs, Greek culture in the Roman era. What's not to like. I'll look for more books with Simon Vance's easy voice. This presentation of Alexandria's history is outstanding. It not only presents factual information in a complete and interesting way, it also draws relationships and implications for the development of Judeo-Christian religion and foundations of Greek/Roman culture and values. A must read for anyone interested in ancient civilizations.